Casa Pueblo Tulum’s minimally appointed suites perfectly capture the contemporary vibe of Tulum. Choose from our King or Queen rooms with garden or second-story views. If Tulum could be made into a room, this would be it. Surrounding our open-air atrium, Casa Pueblo's 16 minimally-appointed suites feature hand-sculpted sconces, plastered walls and floor-to-ceiling windows with slatted wooden shutters. Warmth and comfort define these contemporary spaces – all en-suite bathrooms are spacious and light-filled, with hand-sculpted sinks, walk-in rain showers and natural bathroom products. Guests may choose from KING or QUEEN mattresses and garden or second-story views. The World's coziest mattresses, so you can explore all of Tulum well-rested and restored! For most people, the best days begin with the previous night — and we'll stand by that 100%. That's why we've selected LUUNA mattresses for each and every room at Casa Pueblo Hotels. Your comfort and relaxation is our top priority. And, LUUNA mattresses are 100% made right here in Mexico. Enough is enough with scratchy, rough hotel sheets! We've carefully chosen Parachute Home for one reason: quality first. 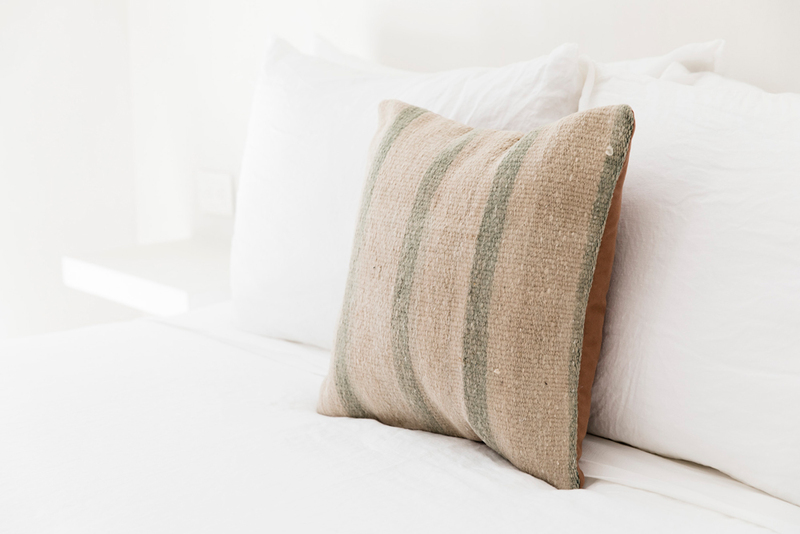 They use only the finest materials: 100% long-staple cotton for their Percale and Sateen, and pure European flax for their linens. The only thing that will help get you out of these sheets is the smell of fresh coffee! It's the little details that add up. Our entire hotel, including each and every room, has speedy and complimentary WiFi. Each room has air conditioning. We've partnered with our good friend, Justin James, on hand-sculpted lighting. Interior design by Mike Moser and Derek Klein, and arcitecture design by Derek Klein, Mike Moser and Jaime Aramburu. We sent out to find one of the most pure and natural products we could. LoredAna makes some of the most beautiful products for both men and women, focused on the old Mexican apothecary style. They care about health and the environment — that's why all their products are free of animal cruelty and friendly to the environment. A place of calm and peace. Whether you're enjoying a early morning coffee or a late night cocktail, we pride ourselves in creating a moment of peace and serenity wherever you are. We've created an aromatic and natural bathroom environment to refresh, revive, and rejuvenate.